Even a quick stop for a cool drink is a treat. The Star Drug Store is so inviting. And inside it’s recess from everyday life. Everything about the Star seems like it is there to please you. And it does. After your first visit, when you return, you’ll feel like a regular. It will seem like you’ve been coming here for years. 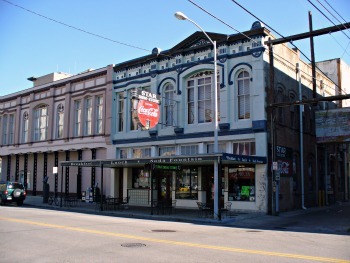 Like Galveston, Star is rich in history. 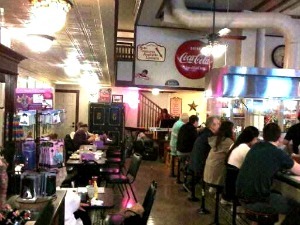 It was the first desegregated lunch counter in Texas. You’ll read more about it at the Star’s counter. That marble counter has been there for generations. Do you ever get a craving for really good pancakes? The ones lightly toasted on the outside, light and fluffy inside? The kind syrup won’t soak into right away. As the butter warms you can smell it melting. Oh that is the pancake! The Star makes them just like that. To preserve that wonderful texture get a side dish. Add your syrup to it. Then dip your pancake into it. Wow that is so good. You can have them thick or thin. These ones are a little thick. I forgot to ask the cook to thin them out a little. That toasted texture seems even better then. To go with them try the sausage patties. Often they are wonderfully spicy. Not too much for early morning though. Do you prefer the basics? Eggs and toast? If so, get the homemade Rye for toast. It is really homemade. It is delicious. Don’t forget; the extra butter and jelly. Ops, that is not the rye in this picture. The best time for breakfast, and lunch is Sunday. Often, Mrs.Tiltis is at the electric piano. With her beautiful voice and piano you are in for a treat! There is such charm on Galveston. I know it’s hard to see, but that’s her in the background. (All I had was my phone camera). 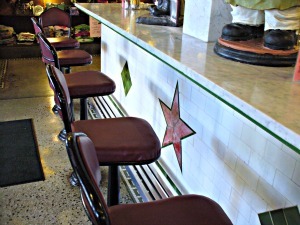 No old time lunch counter is complete without ice cream. You will find plenty to choose from. Here is my favorite on a hot day. 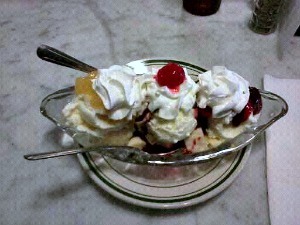 Banana Split! The ice cream is rich and creamy. Um, I miss it already! 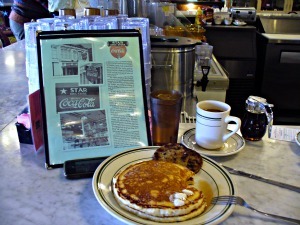 The Star Drug Store often has homemade cakes and pies too. Get yourself a slice and two scoops of ice cream-ah-you area on vacation right? Do you love a great burger? Of course you do! 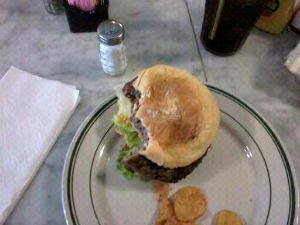 Star Drug Store has the best burger on the island. They are big, lean, delicious and satisfying. Every time I get one it is great! When you return after an absence and the food is the same-great- that’s your proof! Star Drug Store is like that. Now don’t frown, but, no French fries. Trust me the hamburger is all you need! If you want, a bag of chips come with the burger. It is a big burger! 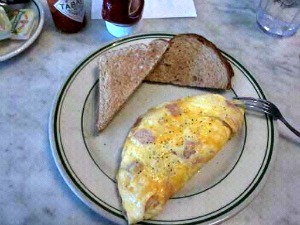 Star Drug Store has the basics; Breakfast, lunch and dinner, plus essential goodies in between. A strange thing can happen here. You’ll be enjoying your coffee, food or companion. Or might be checking out Mardi gras masks. Or just taking it all in. You suddenly realize the place is full of people. You’ll be enjoying yourself so much you’ll wonder when everyone came in! The Star is full of atmosphere. It is one of those things that make Galveston great! If you prefer eat out on the sidewalk. Arriving Galveston from Pittsburgh in January, it’s seems a privilege to eat outside. I don’t exaggerate! If you ride your bike there, lock it to one of the poles. It is safe - Oh, I have to tell you. In late March I stopped at the Star. I felt so tired that morning. After locking the bike I left my four hundred dollar camera and handlebar bag on a table. It completely slipped my mind. I came out. Wow! It was sitting there on the table. Now I don’t recommend doing that. But I thought you might find that interesting. Okay everyone; hope you enjoy those pancakes as much as I do! Until we meet on the next page; bon appetite! 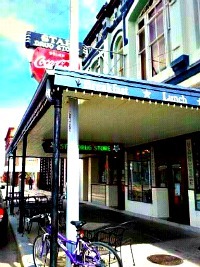 Leave Star Drug Store and return to Galveston Travel and Charm Homepage.